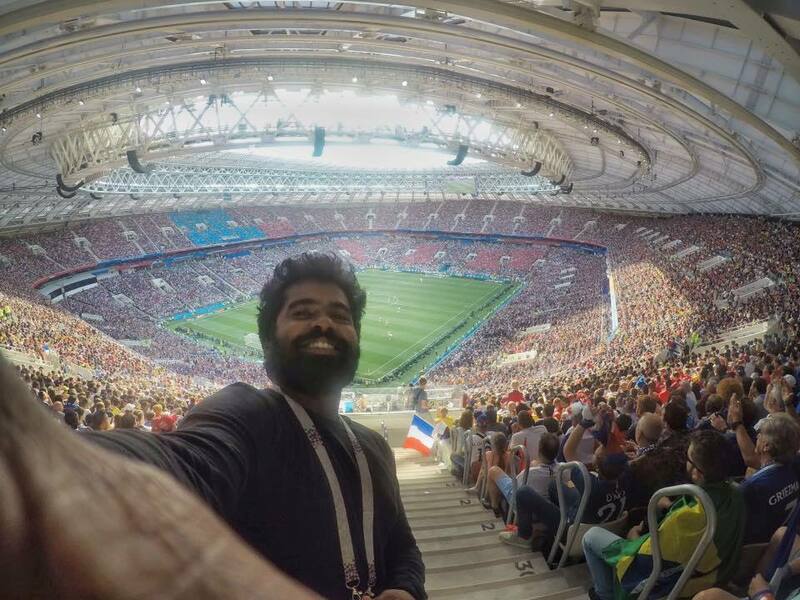 Mid-2018, a young man hailing from Thuravoor near Kochi, was in the news for cycling to Russia to see the FIFA World Cup. This is the story of Clifin Francis; what he did and plans to do next. Azerbaijan is a small country in the South Caucasus region of Eurasia. It has borders with Iran, Georgia, Armenia and Russia. On the east it is bounded by the Caspian Sea. 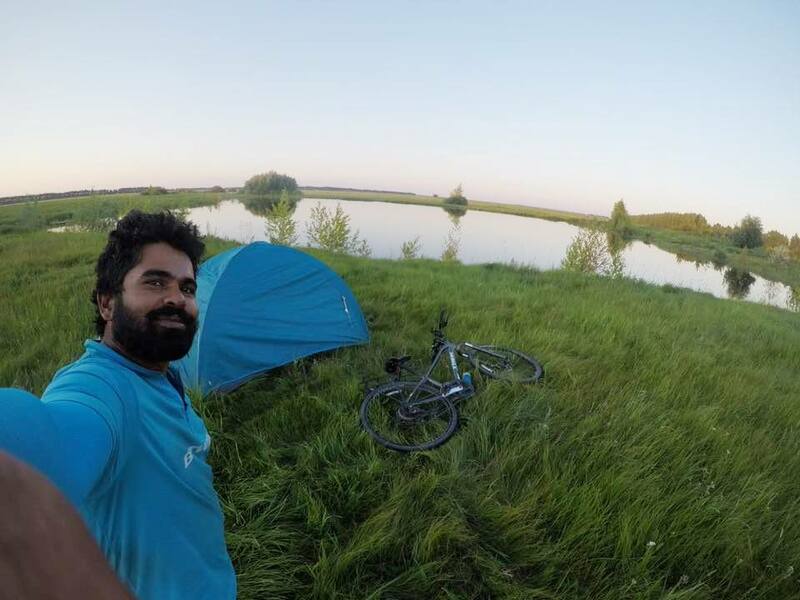 In May 2018, a young cyclist from Kochi in South India made his way to the border of Azerbaijan and Georgia. The specific border crossing he chose was the one linking the city of Balakan in northwestern Azerbaijan to Lagodekhi, a town in Georgia, at the foot of the Greater Caucasus Mountains. It is a location visible on videos posted on the Internet. On the Azerbaijan side, the approach to the border is heralded by a big gateway. The cyclist, who had pedaled in from Baku, faced no problem leaving Azerbaijan. Officials put the exit stamp on his visa. Beyond Azerbaijan’s last check post is a bridge over a dry river bed, at the end of which is the entry to Georgia. With countries at both ends, you could ask: what nation are you on, on the bridge? At the Georgia end of the bridge, trouble awaited cyclist. Although his papers were in order the Georgians denied him entry. He pleaded. They stood firm. No, there was no entering the country. He retraced his steps to Azerbaijan. But with exit stamp already on his visa, he couldn’t return to the country he had just left. Clifin Francis sat there, stuck on the bridge. “ I was in no man’s land,’’ he said. Kochi, October 2018. It is nearly six months since that incident on the bridge. As the time of appointment approached, I left my hotel room and reached MG Road to meet Clifin. Born April 1990 in Thurvaoor, some 25 kilometers south of Kochi, Clifin attended school in Pattanakkad and later joined Kochi’s Model Engineering College (MEC) to study electronics and communication. “ I had no particular interest in sports in school. MEC changed my life. Unlike those brought up in Kochi and other cities, I came from a comparatively rural background. MEC taught me to dream,’’ he said. Passing out from MEC in 2011, Clifin joined Tata Consultancy Services (TCS) in Kochi, working with them for three years. While at TCS he took leave and traveled to Bangkok and Bali. 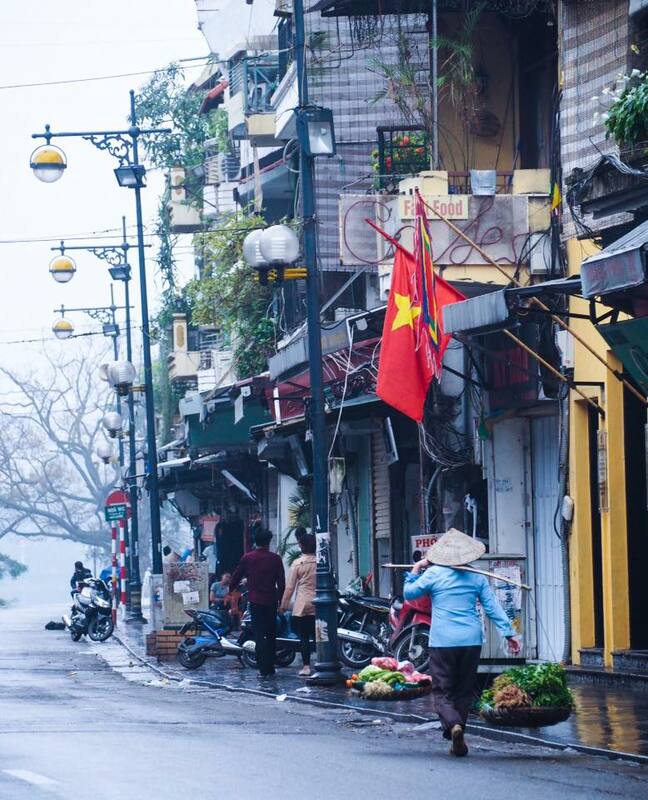 At both these places, he met backpackers and was fascinated by their way of life and the stories they told. “ They were free and surviving with the basic amenities of life,’’ he said. This trip and lessons from it wasn’t the only undercurrent shaping his thoughts. 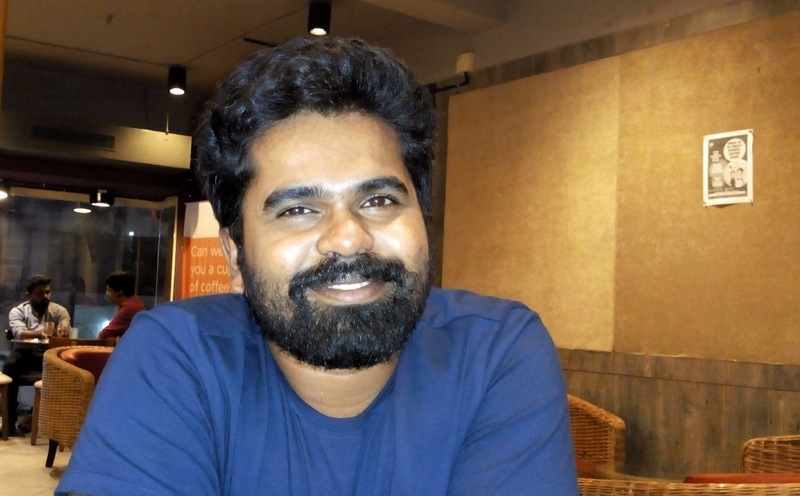 Back in 1999, when Clifin was nine years old, living in Thuravoor and attending school in nearby Pattanakkad, a 21 year old-computer programmer in the US called Casey Fenton conceived the core idea of the nonprofit organization he would set up in 2003 – Couchsurfing. According to Wikipedia, Fenton once took a cheap flight from Boston to Iceland. He did not have lodging. So he hacked into the database of the University of Iceland and randomly emailed some 1500 students, seeking homestay. He got 50-100 offers and wound up staying with an Icelandic rhythm and blues singer. Today, Couchsurfing is a hospitality and social networking service accessed via website and mobile. Members can use the service to arrange homestay, offer lodging and hospitality. While at TCS, Clifin joined Couchsurfing. He hosted two travelers at his house in Kochi. One of them specialized in traveling overland. He inspired the young man from Thuravoor to contemplate border-crossing, wherein instead of flying in to destinations, you travel overland and cross borders as people did in era preceding commercial aviation. By then, the French sports goods chain, Decathlon, had opened outlets in Kochi. Fired up by thoughts of travel, Clifin visited Decathlon and bought tent, sleeping bag and a few other items. Dreams don’t die. They hibernate, nudging you gently, unconsciously to the true nature of your wiring. The typical Malayali life follows a pattern. Through school and college, academics dominate. Once done with that, career dominates. Vindication of time spent minting success, is well settled life replete with family, handsome bank balance, house (or houses), car et al; with of course address overseas prized above all else. Clifin wrote the Common Admission Test (CAT) to pursue a course in Master of Business Administration (MBA); according to him, his scores were good enough for admission to the country’s elite business schools. Friends recommended that Clifin go for MBA. However, he decided that he should take a break. So he resigned his job and spent six months backpacking through India. The trip took him to Hampi, Mumbai, Rajasthan, Varanasi and India’s North East. 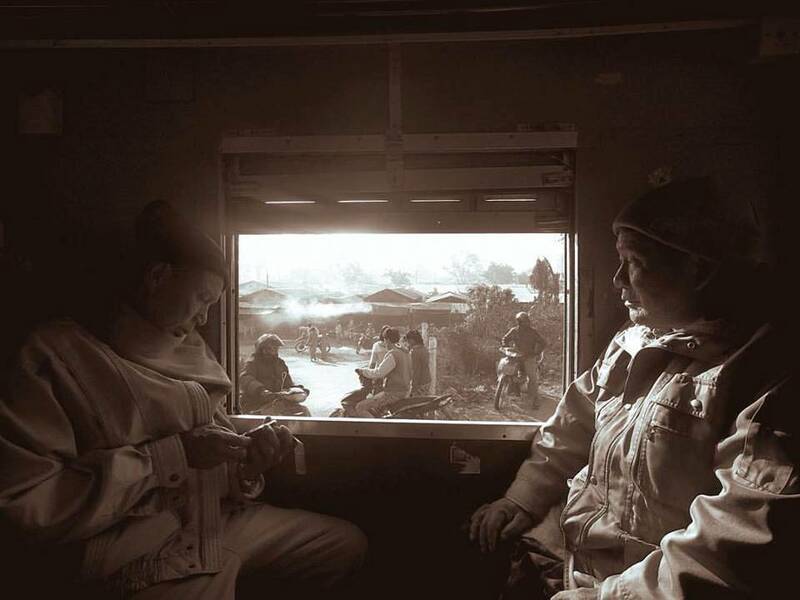 Then taking a leaf out of what the overland traveler had told him back at his house in Kochi, he crossed from Manipur in North East India to Myanmar and traveled on through that country to Thailand, Laos and Cambodia. On this trip he met a new type of traveler – those touring on bicycles. The cyclists he met included a person from Kerala, who worked in Bengaluru and was cycling in Laos. “ I felt I must try that lifestyle,’’ Clifin said. 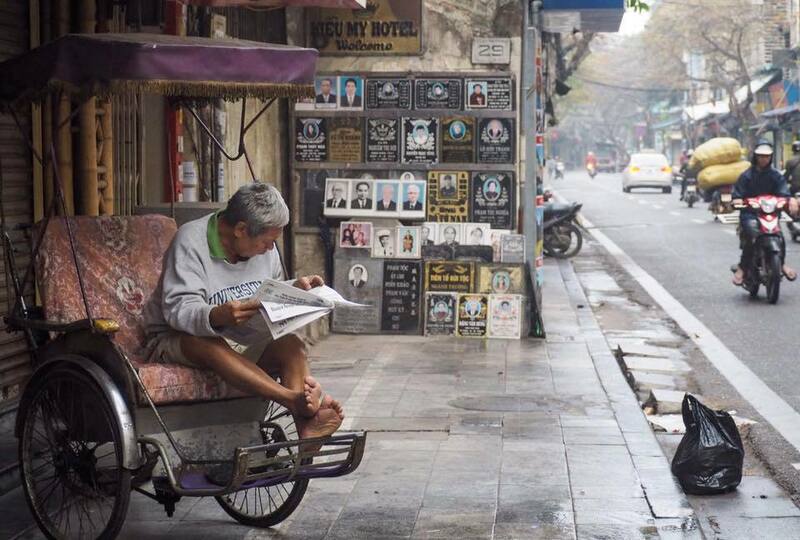 Thanks to traveling and the way he was doing it, his views about life changed. “ I realized the value of time. Money is not that important. You can tackle time in a cost efficient manner. You just have to choose the correct options,’’ he said. On his return from South East Asia, the erstwhile TCS employee decided that he will be a freelance teacher. It seemed better suited for the kind of life he sought. “ It is not like if you are an engineer you have to be one for life,’’ he said, taking a sip from the drink he had ordered. The café was a compact one, on the first floor of a building overlooking MG Road. Outside, Kochi had changed considerably. Through the glass windows one saw the pillars of the city’s new elevated metro. Across the road, the iconic cinema theater, Shenoy’s – by which name the locality was known and continues to be known – was under renovation to become a multiplex; the plot it stood on was shielded from public view by aluminum sheets. For many youngsters in India, their education progresses towards a set of life defining tests. Thousands of students pass out from college / intermediate college every year and then confront a series of competitive exams to study professional courses like engineering, medicine, MBA, accountancy; even a shot at becoming bureaucrat in government or joining the armed forces. Not to mention, tests to qualify for studying abroad. Preparing students for the plethora of tests that abound is a big industry in India. According to their website, as of September 2017, Career Launcher had 200 test-prep schools in 100 cities in India. The brand was over two decades old by then. Post TCS and backpacking stint, Clifin joined Career Launcher as a freelance teacher teaching mathematics and logical reasoning to students wishing to appear for CAT. His daily work straddled two coaching centers in Kochi – he taught at the center in Kakkanad in the morning and the one at Ravipuram by evening. Alongside, an idea had been brewing in his head. It started sometime in 2015-16, before Career Launcher; on the flight from Bangkok to Kochi. Football is a much loved game in Kerala. Local teams, football leagues and tournaments abound. Teams like Travancore Titanium, Kerala Police and FACT are remembered by old timers while the new crop includes Kerala Blasters and Gokulam Kerala FC. Once every four years, the FIFA World Cup becomes a craze across Kerala. People identify strongly with their favorite teams, some paint their houses in team colors, put up large billboards featuring football stars; you will even find colorful portraits of leading players drawn on the side of transport buses. Like most Malayalis, Clifin liked football. He used to watch important matches telecast on TV. Indeed, at his house in Thuravoor, the 1998 FIFA World Cup (held in France and won by the home team defeating Brazil 3-0 in the final) had seen his father buy a new TV. But TV was no more pinnacle of watching sport. With economic development and rising affluence, Indians have been traveling to major events like the football World Cup and the Olympics. The 2018 FIFA World Cup was due in Russia. Inspired by backpacking, the stories he had heard and the cyclists he met, Clifin wondered: how about cycling to Russia and watching the World Cup there? That would combine travel, cycling and his affection for football. He decided to take the plunge. He shared the idea with his friends. But they were skeptical. “ They said, I will reach Russia but not on a bicycle,’’ Clifin said. One of his friends, Namsheer Koraliyadan, thought differently. Hailing from Malappuram, Namsheer liked football. He met Clifin at MEC, where both did their BTech. The two bought bicycles; Clifin bought a Cosmic hybrid while Namsheer bought a Btwin MTB. They cycled on and off around Kochi and to nearby places. 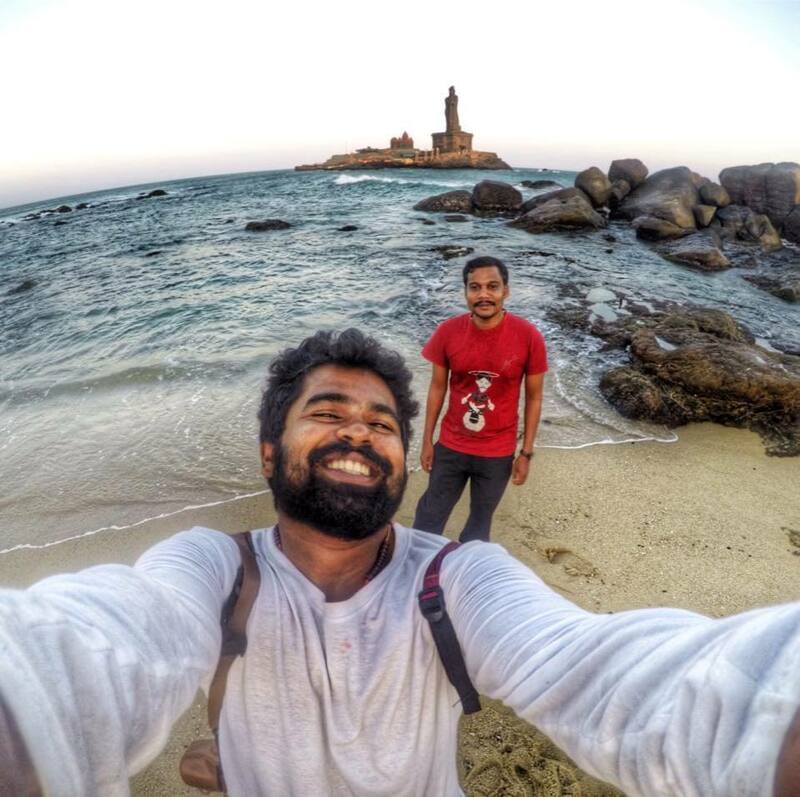 On one occasion, they rode all the way from Kochi to Kanyakumari, the southern tip of mainland India. In course of time, Clifin upgraded – he bought a Merida Crossway hybrid. However there was a problem – it was tough getting the right size of bike; something that matters, when dreaming of riding long. On incorrectly sized bike, cycling long hours for several days can reduce cyclist to picture of suffering. Kochi’s drawback was that it didn’t have a facility to properly measure cyclist and match him / her to appropriate bike. “ My arms are short. That made me sensitive to size of bicycle,’’ Clifin said. He trusted Paul Mathew of The Bike Store to help him find the correct bike but beyond telling him the truth about the mismatch between his body size and bike frames available in town, there wasn’t much Paul could do. Meanwhile there was no shortage of audacity in planning the Russia trip. In October 2017, the FIFA U-17 World Cup was held in India (the Indian edition went on to see the highest ever attendance in the event’s history with 1,347,133 fans turning up to watch). According to Namsheer, Clifin and he planned on cycling to some of the U-17 venues and then, cycling on to catch the 2018 FIFA World Cup in Russia. They even contemplated cycling through Pakistan. “ We understood soon, that’s impossible for Indians,’’ Clifin told me at the cafe. Meanwhile, Namsheer got married and dropped out from proposed trip. Clifin looked at accessing Russia from Mongolia. He scrapped that idea because the distance – including China – was too daunting for rookie cyclist. He may end up taking longer than what a visa usually permits. Further, if instead of tackling China from its south eastern provinces up, he elected to cut across from Nepal, the cost would likely escalate because of Himalaya and Tibet in between. “ My budget was $ 1000 apart from cost of bicycle and I didn’t want to hurry while cycling. It is not a race, it is a slow, relaxed journey doing what I feel like,’’ he said. 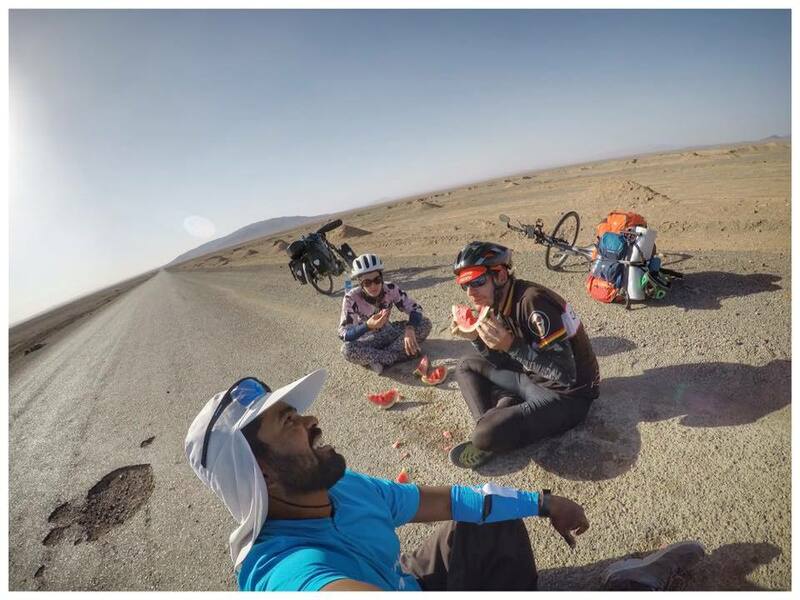 The alternative was to start cycling from Iran and reach Russia through Azerbaijan and Georgia. Both Azerbaijan and Georgia give Indians visa on arrival. End-February 2018, two of his friends dropped Clifin off at Kochi’s Nedumbassery airport. The long planned expedition was finally commencing although he still had no bicycle for the long ride. Namsheer recalled the sight. “ He had just a backpack,’’ he said. Aside from what he had packed for the expedition, Clifin carried with him a parcel his aunt had sent along for his cousin in Dubai. Clifin spent two weeks in Dubai. He visited as many bike shops as he could. Eventually, he bought a Trek DS-1 hybrid with 24 gears, front suspension and no lockout. In general, the Internet speaks of it favorably as a dual sport model, one that commutes well and also handles trails to an extent, provided you tackle uneven surfaces keeping in mind that it is not a MTB, but a hybrid. The shop did the bike fitting and Clifin dispatched pictures of him on the bike to Paul in Kochi for his approval. “ He replied – that’s a good one. That’s when I decided to buy it,’’ Clifin said. 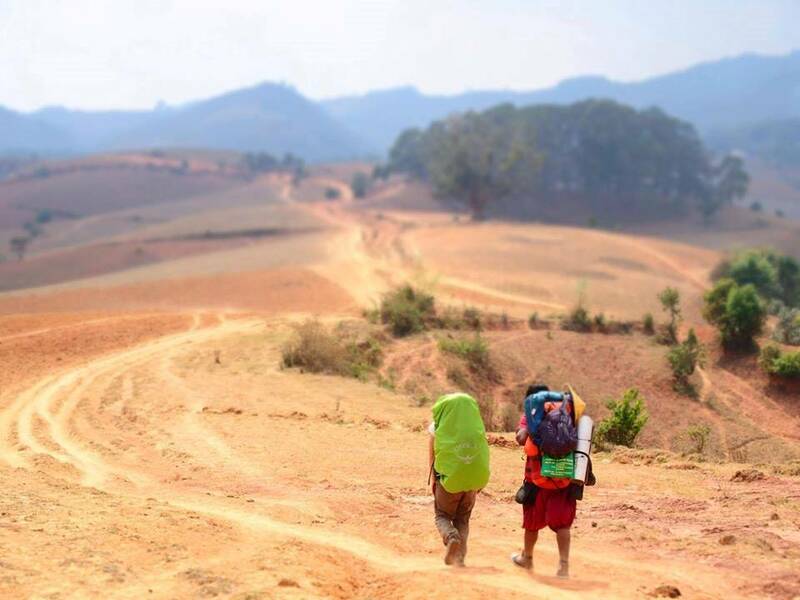 His friends then dispatched bicycle panniers and camping gear to him, from Kochi. 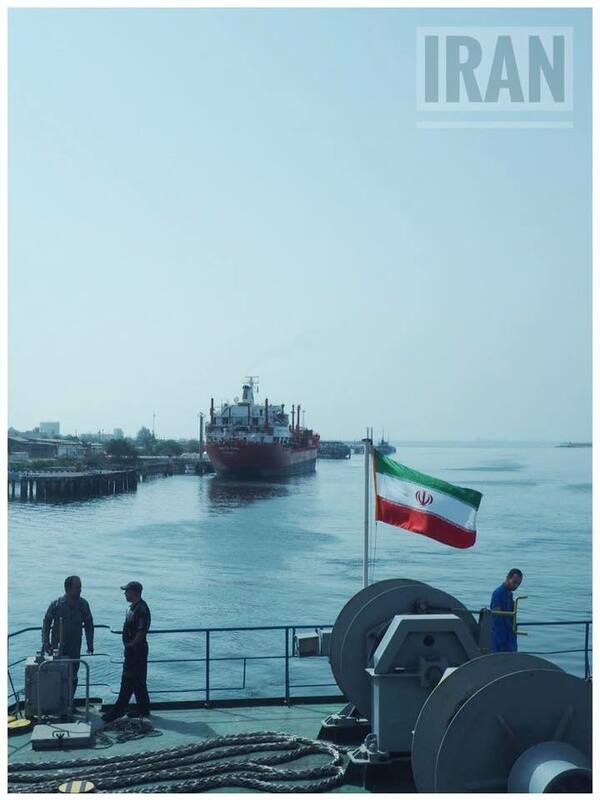 Early March, Clifin and Trek, took the ship from Sharjah to Bandar Abbas, the port city in southern Iran. He had about 20 kilos on the bike – two paniers of 15 liters capacity each and a large backpack. Officials at the Iranian port were used to cyclists coming through. They welcomed him in. That day, the first day of his expedition, he got his first puncture. It is a window to Clifin’s nature. Shuttling between his teaching assignments in Kochi, Clifin hadn’t found the time to train systematically for the long ride from Bandar Abbas to Moscow. He hadn’t learnt bicycle maintenance. When they got punctures on the trip to Kanyakumari from Kochi, Clifin and Namsheer had visited roadside mechanics to get things fixed. Strangely, none of that seems to have bothered Clifin. It is as though he views everything that unfolds – in whatever way it does – as life. “ I have no ego. I used to hitchhike. I think everyone should try hitchhiking. It takes away the ego. You try, try, try….people don’t stop to give you a lift. Who do you get angry at? What’s the point?’’ Clifin asked. So he rolled up his sleeves, got down to work and learnt how to fix a puncture that first day in Iran. It was good he did so for Iranian roads weren’t smooth everywhere and he had a day with five punctures to fix, all on the rear wheel. Other cyclists on the ship to Bandar Abbas had advised Clifin to take it easy on the road initially. They had a reason. The route Clifin was on could easily end up being deceptive for newcomer to cycling. Iran is one of the world’s most mountainous countries. The bulk of the mountains are in the west and Azerbaijan, the country Clifin had to be in next, lay to the northwest. A rookie cyclist starting from sea level at Bandar Abbas, may race off from start and overlook saving oneself for the rugged terrain to follow. It is wiser to treat distance and terrain with respect. Heeding the advice, in the initial phase of his tour, Clifin covered 50-60 kilometers every day. Then he slowly ramped it up, till on some days, he was touching 140 kilometers. 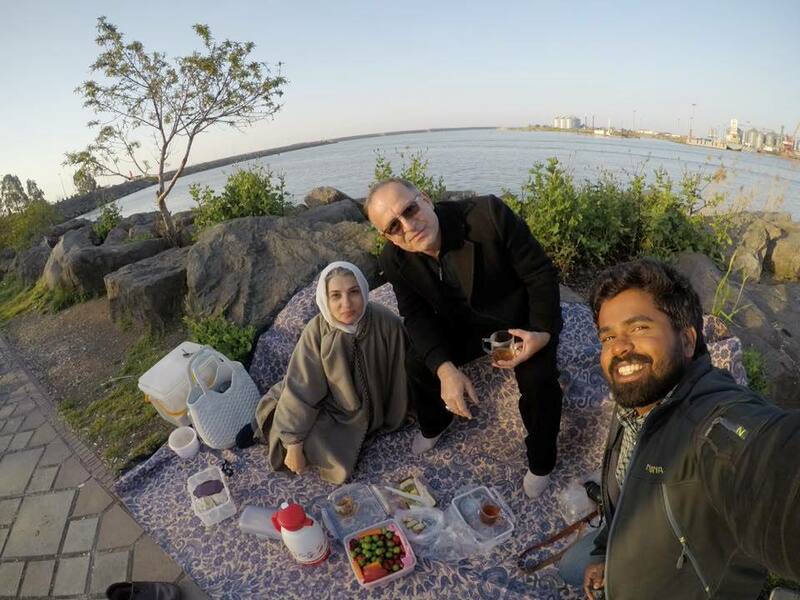 “ People were really nice in Iran. They love football. They were happy to see somebody cycling to Russia for the World Cup. They asked me to support Iran’s football team at the event. The only problem in Iran was that it was dry country. I couldn’t get chilled beer!’’ Clifin said. 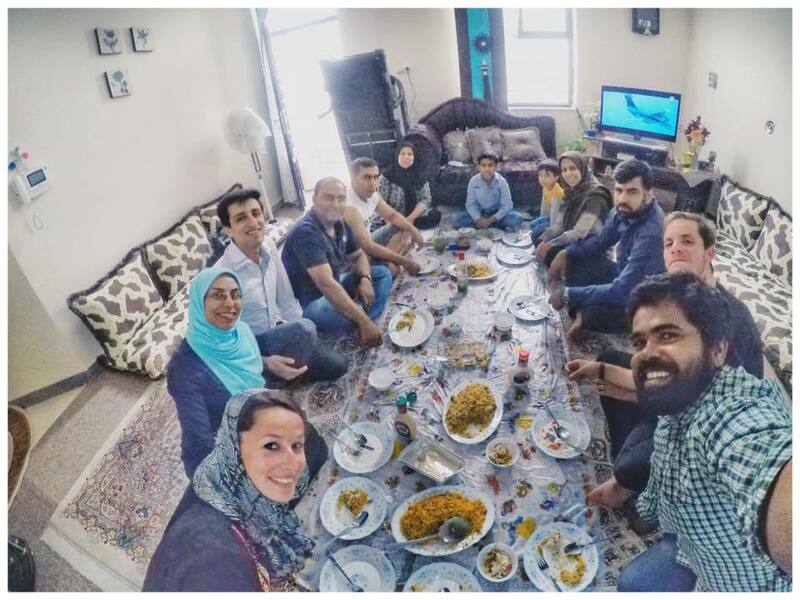 Of the 45 days he spent crossing Iran, he stayed in hostels on only two occasions. All other days, he slept in his tent, at people’s houses or at mosques. Meanwhile back home in Kochi, Clifin’s expedition was becoming real to his friends. “ Not everyone thought he would do it. As the journey progressed, people started believing,’’ Namsheer said. By the time Clifin reached the Azerbaijan border, he had lost weight; he had also become sunburnt from days on the road. The officials at the Iran-Azerbaijan border took some time to approve his entry. Nobody was rude; they just took time. Landscape and culture was different in Azerbaijan. High point for Clifin was running into Siraj from north Kerala who runs a restaurant in Baku. “ Baku is a beautiful city,’’ Clifin said. He stayed with Siraj for a week enjoying the place and devouring Indian food. Azerbaijan is located in the South Caucasus region. Over one half of it is made of mountain ridges, crests and plateaus; the rest consists of plains and lowlands. Clifin covered Azerbaijan in a month’s time, including the time he spent in Baku. 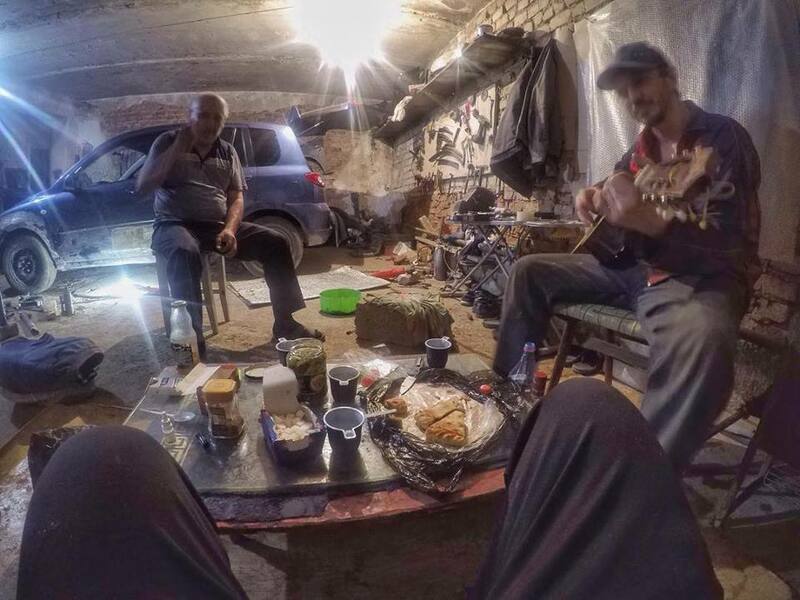 When he reached the Balakan-Lagodekhi border gate some 390 kilometers away from Baku, he was in the company of a German cyclist. “ They let the German cyclist through to Georgia. But I was denied permission by the Georgian authorities. I had the required visa and documents. 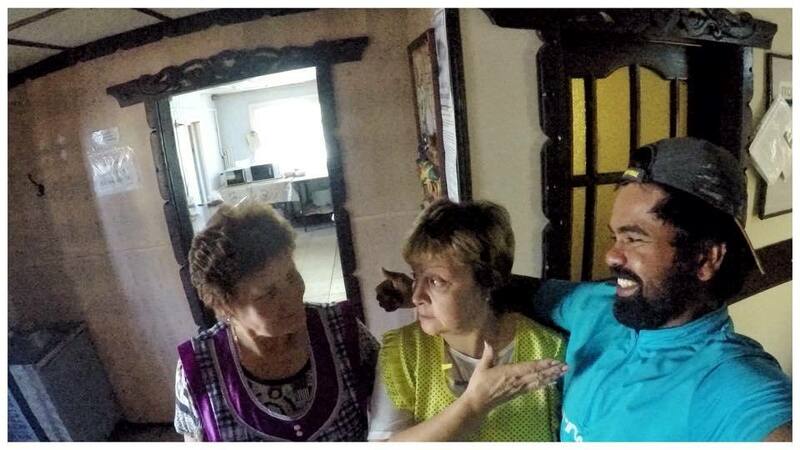 They didn’t give me any reason for denying entry,’’ Clifin said. He was left stranded on that bridge. What saved him was a small but crucial gesture by the German cyclist. As they pass from one country to the next, it is normal for cyclists to buy a local SIM card for their cellphone. Clifin had bought one in Azerbaijan. Anticipating exit to Georgia (and new SIM thereafter), some 15 kilometers ahead of the Balakan-Lagodekhi border crossing, he gave his SIM to another cyclist for use in Azerbaijan. At the Georgia end of the bridge, as refusal of permission for him to cross unfolded, Clifin was without a local SIM in his phone. Luckily, before he entered Georgia, the German cyclist handed Clifin his Azerbaijan SIM card. Using that, Clifin was able to call up people at the Georgian embassy in Baku. But there was nothing they could do – they represented external affairs while the border crossing was handled by internal affairs. With no other option at hand, Clifin worked the cellphone and applied for an e-visa for entry back into Azerbaijan. All this time and for more that day, he sat parked on the bridge; neither in Georgia nor in Azerbaijan. People passing by asked him where he was headed and what happened. They gave him food and water. It was night by the time e-visa was received and he could return to Azerbaijan, stone’s throw away. “ It was an experience, waiting on that bridge. But not as bad as what happened to me in the desert in Iran. On the bridge, I knew I would get food and water. They won’t let me starve. So it was okay. The experience taught me patience,’’ Clifin said. 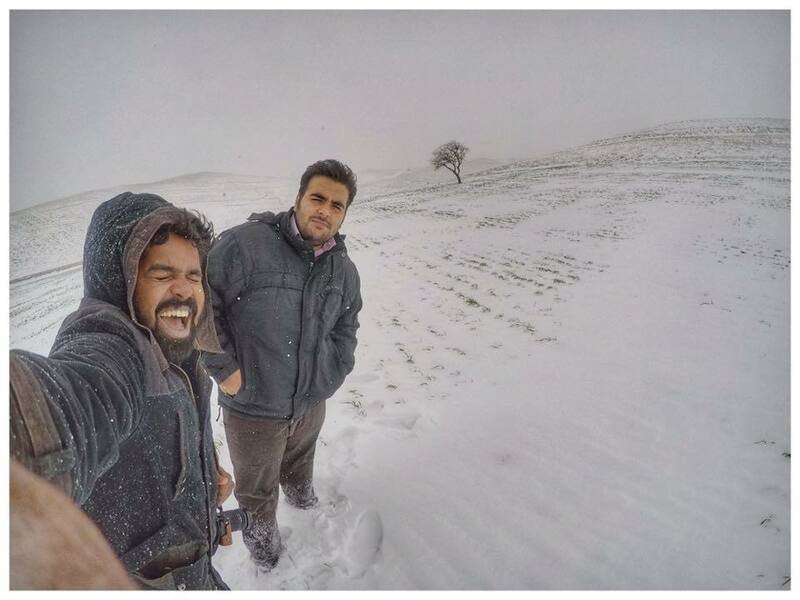 Earlier in Iran, in a place he described as desert, he had got lost. There was no road. His GPS had stopped working. He cycled on looking for footprints or tracks. There was none for close to seven hours; there wasn’t a soul around. He started to panic. “ I realized, it was fear,’’ Clifin said. After those seven hours, a man showed up. Conversation was tough for the man spoke only Farsi. In utterly basic Farsi with some gestures thrown in for good measure, Clifin managed to indicate Bandar Abbas way behind, two weeks through Iran spent on the saddle and Russia ahead for destination. That was enough to find him roof for the night. He stayed in that man’s house. Dagestan, officially called the Republic of Dagestan, is a federal subject of Russia located in the north Caucasus region. According to Wikipedia, Russia has 22 republics, 46 oblasts, nine krais, four autonomous okrugs, three federal cities and one autonomous oblast. A republic in Russia is nominally autonomous with its own constitution and legislature but is represented by the federal government in international affairs. Each republic is meant to be home to a specific ethnic minority. With an area of 50,300 square kilometers, Dagestan is a small republic. It is also the most heterogeneous of Russia’s republics, with the largest ethnicity constituting no more than 30 per cent of the population. Since the 1990s, Dagestan has witnessed Islamic insurgency and occasional outbreaks of separatism and ethnic tensions. The province is also close to Chechnya, a known trouble spot. On the map, Azerbaijan; Armenia, Georgia, Dagestan – they are all located on a strip of land sandwiched between the Black Sea and the Caspian Sea. The strip connects Russia to Iran. You can cross from Azerbaijan into Dagestan and thereby be directly in Russia. But Clifin wasn’t sure how safe it would be. That’s why he had elected to reach Russia via Georgia. Now with the Balakan-Lagodekhi border crossing shut to him, Dagestan remained sole possibility. The new border crossing was 200 kilometers away from Baku. It took him three days to reach. “ I was scared in the beginning,’’ he said. After all, he had been turned back at the border with Georgia. 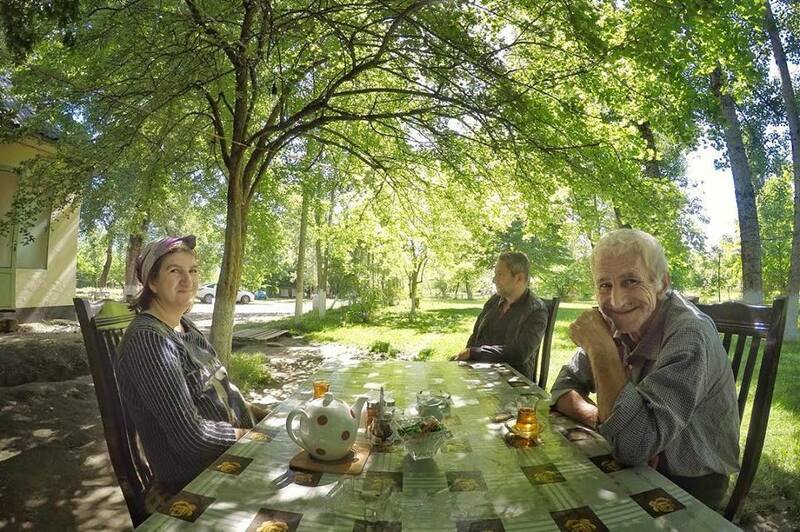 Dagestan also had political and ethnic tensions within for visitor to think about. But once the guards saw his football fan ID (part of FIFA’s ticketing paraphernalia) and realized he was from India, they began asking him about Indian film stars, Amitabh Bachchan and Mithun Chakraborty. Clifin breathed a sigh of relief. He was thrilled when the electronically operated gates at the border parted and Russia loomed before cyclist. “ I felt really happy crossing the border here,’’ he said. Dagestan was also where he – Indian football fan cycling in from Bandar Abbas and on his way to Moscow for FIFA World Cup – got interviewed by a local TV channel. Result – here and there on the road, he was recognized. It is over 2000 kilometers from Dagestan to Moscow. He covered it in a little over a month, securing details of best routes possible from local members of the Warmshowers community (founded in the US in 1993 as a hospitality exchange for bicycle tourists, Warmshowers had some 85,000 members worldwide by early 2018). 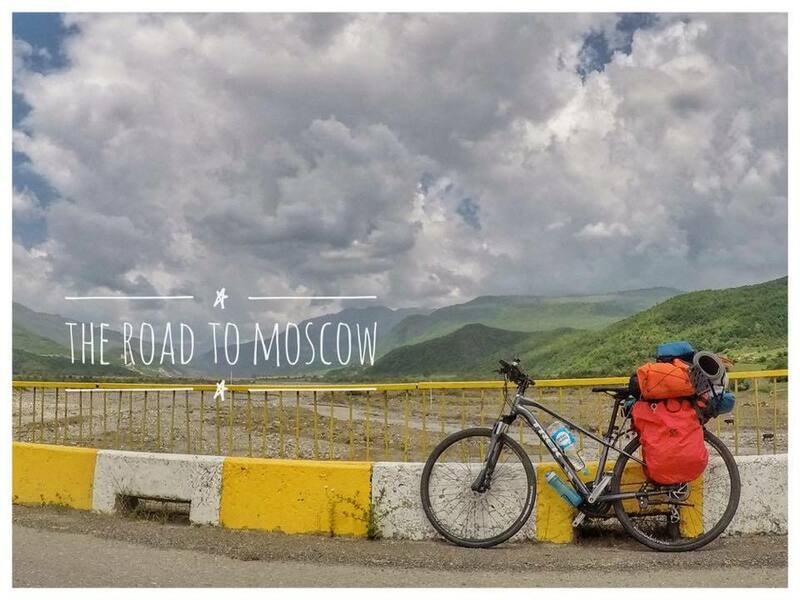 “ This last stretch – the route from Dagestan to Moscow – was comparatively easy for me. The only problem was that the road wasn’t consistently good and at places, there was no cycle path. The people were nice and very relaxed. They were welcoming of stranger cycling through their land,’’ Clifin said. As per original plans, two World Cup tickets had been procured – one for him; one for Namsheer. But with the latter dropping out, his ticket was passed on to another friend from Kochi, Anand V.K. He was Clifin’s senior at MEC. But following a brief stint as software engineer in Bengaluru, Anand first attempted to join the civil services and later, shifted to coaching others for civil service exams. Eventually he joined Customs & Central Excise as an officer. Anand was originally part of Cliffin’s Russia plans but had withdrawn when he learnt that the idea was to cycle. Cliffin had stayed in touch with him during sections of the journey; especially after the incident at the Georgia border. Anand had batch mates in the civil service and friends of theirs stationed in Moscow helped verify how safe the Dagestan route would be. Anand reached Moscow on June 11 for the FIFA World Cup. He had booked accommodation at an Air BNB close to Red Square. From that day on, Clifin spoke to him almost daily apprising him of his progress. “ On June 24, all the others who were staying with me – four people in fact – left for Kazan to watch the Germany-South Korea match. It was around 6-7 PM and they were just leaving, when Clifin arrived on his bicycle,’’ Anand said. By now Clifin’s story had become well known. Somewhere during his ride through Russia, a friend who saw his periodic posts on Facebook had linked him up with a journalist. The story appeared on Manorama Online, a popular media website. The day after Clifin reached Moscow, there were interactions with the media in Moscow’s Red Square, following which he and Anand were invited for lunch at a leading Indian restaurant. 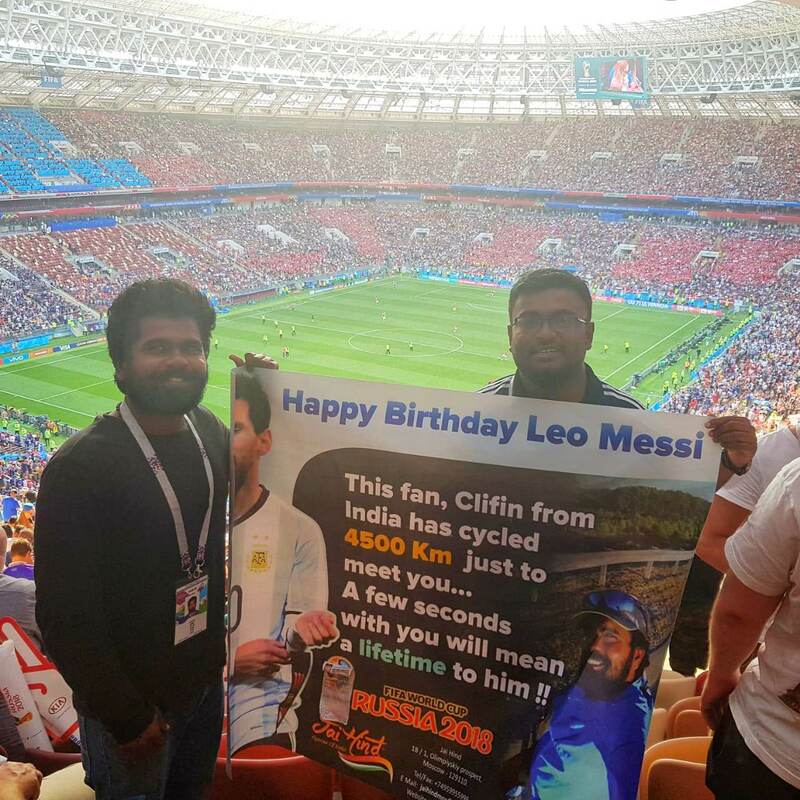 On June 26, ticket in hand and carrying a printed poster expressing Clifin’s wish to meet Lionel Messi (which they hoped TV cameras would pick up), Clifin and Anand went to the stadium to see the qualifying match played between France and Denmark. It ended in a goalless draw. Clifin stayed in Moscow for the entire duration of the FIFA World Cup. He saw the remaining matches in the Fan Zone outside the stadium, where big TV screens had been installed. France won the World Cup beating Croatia 4-2 in the final. It was a disastrous World Cup for Argentina; they were knocked out by France early in the tournament. Clifin didn’t meet Messi. Clifin’s Trek DS-1 held up fairly well through the whole journey. Besides his personal supplies and camping gear, he had carried along for the trip, 3-4 spare tubes, a puncture kit, a spare tyre, bicycle tools and a full sized pump. He had his share of punctures, which he learnt to fix on the go. Luckily most cities in the world have a cycling club. “ They helped in locating service centers for the bike,’’ Clifin said. For the return trip to India, a bike shop in Moscow dismantled the bike and packed it for him. 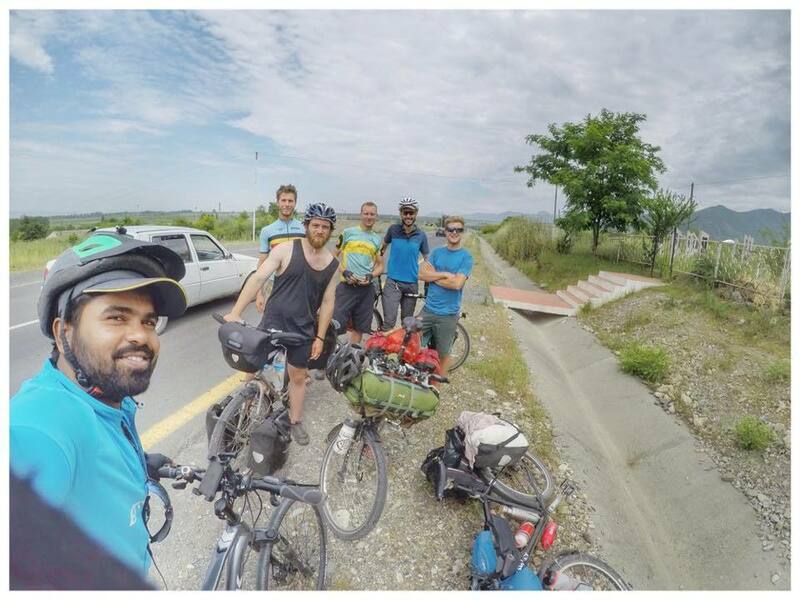 “ I told them that I had cycled from Bandar Abbas to Moscow but did not know how to pack my bicycle,’’ he said, a mixture of embarrassment and laughter playing on his face. The flight from Moscow to Delhi took six hours. From Delhi, he flew to Kochi, where his friends – four of them, this time – came to the airport to receive him. “ He had informed us that given bicycle and luggage only two people should come,’’ Namsheer said. Clifin had been away for five months. He returned to work at Career Launcher. Clifin hopes to write a book on his journey. He also has plans, at a very nascent stage, for his next journey – cycle from Kochi to Japan for the 2020 Tokyo Olympics. “ I can cycle to Shanghai and take a ferry from there to Japan or cycle to Vladivostok via Mongolia and take a ferry from there. This time he wants to cycle for a cause. “ I want to give back for the love I got from people,’’ he said. Also planned, is documenting the trip. He has begun learning photography and videography. As he spoke, the `also’ list slowly grew – he must buy a new camera, he must find sponsors and yes, he would like a new bicycle; a proper touring bike. We had chatted for a long time and it was getting late. For a city of its size, Kochi seemed to retire early. Or maybe, as an autorickshaw driver would tell me: MG Road is no more where the action is; life has shifted to the suburbs. “ It is time for the last bus to where I live,’’ Clifin said as we shook hands and parted ways on a MG Road, rain swept and bereft of activity at that hour, except at its eateries. This entry was posted in Human Interest, Outdoors / Travel, People. Bookmark the permalink.